House Floor. The House will return Nov. 13. Senate Floor. The Senate is in session this week and will vote on legislation to reauthorize the Water Resources Development Act. The measure, which will authorize federal funding for water infrastructure projects, was approved by the House Sept. 13. On Saturday, a deeply divided Senate voted 50-48 to confirm Brett Kavanaugh as a Supreme Court Justice. The narrow margin contrasts sharply with two votes taken last week when the Senate passed a five-year reauthorization of FAA programs, 93-6, and approved legislation to combat the opioid crisis, 96-1. President Trump signed the FAA bill on Friday. NAFTA/USMCA. The newly minted U.S.-Mexico-Canada Agreement (USMCA) is expected to be signed by the three countries at the end of November. As Congress and various stakeholders dive into the details, the Trade Promotion Authority statute requires the International Trade Commission to produce a report no later than 105 days after signing. 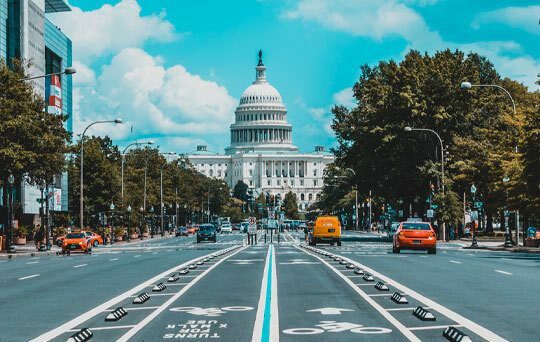 While there continues to be chatter about expediting that study and bringing the USMCA implementing bill before Congress in the post-election lame duck session, most in the trade world expect it will be considered by the next Congress. Big Picture. 2019 will see the 55th Speaker of the House elected by his or her peers, and it remains to be seen whether it will be a Republican or Democrat. Both parties will be faced with the choice of sticking with the status quo or turning to new leaders. Regardless of whether they win or lose the House, Democrats will have to decide whether to support Nancy Pelosi, their leader for over a decade. At 78, Pelosi would be the second oldest Speaker ever elected, while Steny Hoyer, who is 79 and number two in the Democratic ranks, would be the oldest-ever elected Speaker. It has been reported that 46 Democratic candidates and 11 current Democratic House members have said they will not vote for Pelosi for Speaker. This could be a problem for Pelosi as the Speaker is elected by a vote of the entire House. Republicans also have questions to answer, win or lose. Speaker Paul Ryan is retiring, and he has endorsed his second-in-command, Majority Leader Kevin McCarthy. Some Republicans, however, would prefer Majority Whip Steve Scalise, who has said he will not challenge McCarthy. Long-shot candidate Jim Jordan, leader of the Freedom Caucus, has thrown his hat into the ring. If Republicans retain the House, Trump loyalists would likely be buoyed, while if they lose the question will become what do we do to win in 2020 and do we stick with the President. The margin of victory will be a key factor for both sides in determining who would take over as Speaker. Democratic ranks have been restless, while Republicans will have to sort out their loyalties to the President. With fivethirtyeight projecting that Democrats win a net of 33 seats, the margin in the House would be the closest it has been since the 107th Congress (2001-2002), making party unity a must-have in order to move legislative priorities in the 116th Congress. Factoid #1. In midterm elections since 1862, the president's party has averaged losses of about 32 seats in the House and more than two seats in the Senate. Only twice, in 1934 and 2002, has the president's party actually gained in both the House and the Senate. Factoid #2. The average age of members of the House at the start of the 115th Congress was 57.8 years old, with newly elected members on average being 50.8 years old. Of the open seats in the House, the average age of the departing member is 59.7 years. Featured House Race – Wisconsin-1. Ten-term Republican Paul Ryan is retiring after just three years as Speaker of the House. Trump won the Wisconsin 1st by 11 points, but race rankers have moved the suburban Milwaukee district to Lean Republican from a Safe Republican seat over the past few months. Republican candidate Bryan Steil is a 37-year-old lawyer from a prominent Wisconsin family who was handpicked by his former boss, Speaker Ryan, to run for the open seat. Democratic candidate Randy Bryce is a former iron worker and Army veteran who has been a prolific fundraiser, bringing in over $2 million so far (more than double what Steil has raised). Paul Ryan won easily in his 10 terms, never receiving less than 55% of the vote. It will be an uphill climb for the Democrats to take the seat that Ryan held safely for 20 years. Featured Senate Race – North Dakota. Heitkamp has been a consistent moderate Democrat during her one term in office, having been rated by GovTrack as slightly more conservative than Republican Senator Susan Collins of Maine. Cramer was initially reluctant to enter into the North Dakota Senate race but eventually jumped in. While Heitkamp might have slightly higher statewide recognition as a Senator, Cramer is not far behind. There is only one Congressional district in North Dakota, so Cramer represents the entire state. Trump won North Dakota by 36 points in 2016. Heitkamp won her Senate seat by less than 3,000 votes in 2012. Pollsters have this as the tightest race in the Senate this year, although the latest polls show Cramer leading by 10 points. Enthusiasm over Trump’s policies, including the Kavanaugh nomination, will be key in turning out North Dakota voters in this race.